DUNSFOLD, although only an hour from London is served solely by local roads and so enjoys a tranquillity that is difficult to find in South East England. Originally Saxon, Dunsfold is now the very image of a quintessential English village, surrounded by woodland. In its centre is the village green, a cricket pitch, a village shop a public house and two magical ponds graced with swans. St Mary and All Saints is the most exquisite 13th century village church “the most beautiful country church in England” William Morris wrote. 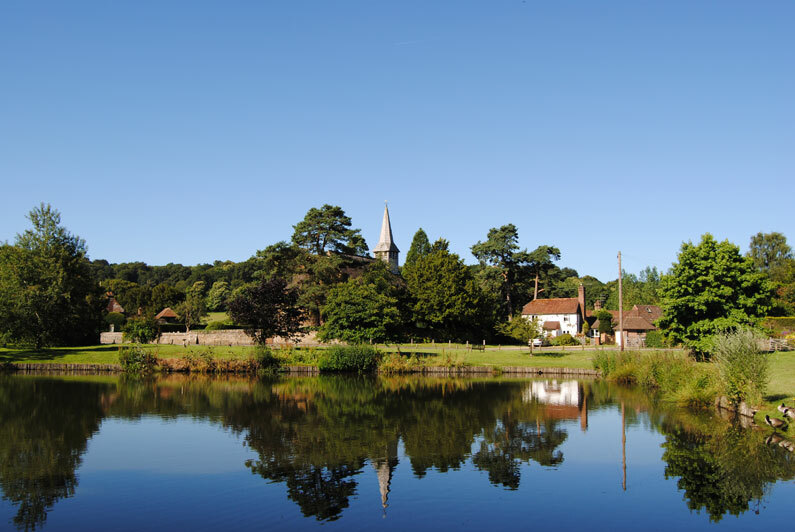 HASCOMBE lies in a valley encircled by tree covered hills and is one of Surrey’s quietest and most idyllic villages. The beautiful St Peters Church sits at the heart of the village and only a few steps away, stands The White Horse Inn, a classic flagstone and beamed pub with open fires and a large garden, perfect for a pre-service drink! RAIL & AIR LINKS Godalming and Guildford railway stations, with their fast services into London Waterloo are located 15 and 20 minutes away respectively. We are equidistant between Gatwick and Heathrow airports which are both approximately 50 minutes away.